a Business Fellows Scholarship toward tuition during the academic year, renewable assuming continued participation in the Business Fellows Program. The Business Fellows program equips future attorneys with the knowledge and skills necessary to become lawyers who will understand their clients’ businesses, ranging from entrepreneurial start-ups to large, publicly-traded companies, and provide these clients useful counsel on both the legal and business challenges confronting them. The breadth of experience Elon Law will provide, and the emphasis on “doing” rather than just “studying,” will help Elon Law Business Fellows to appreciate that modern business clients require their lawyers not just to answer discrete legal questions, but to understand the interconnectedness between legal and business issues. When they graduate, Business Fellows will have the foundation to become lawyers who will understand their clients’ businesses and provide useful counsel on both legal and business challenges confronting their clients. Opportunities to meet with leading business lawyers and business leaders through an annual speaker series. During the 2014-15 academic year students will have the opportunity to meet: Louis Bledsoe, new North Carolina Business Court judge; John Fukunaga of Sony Pictures; Garland Graham, attorney with Schell Bray; Lee Lloyd, investment banker and business attorney with J. Lee Lloyd, LLC; Alan Palmiter, Wake Forest law professor. 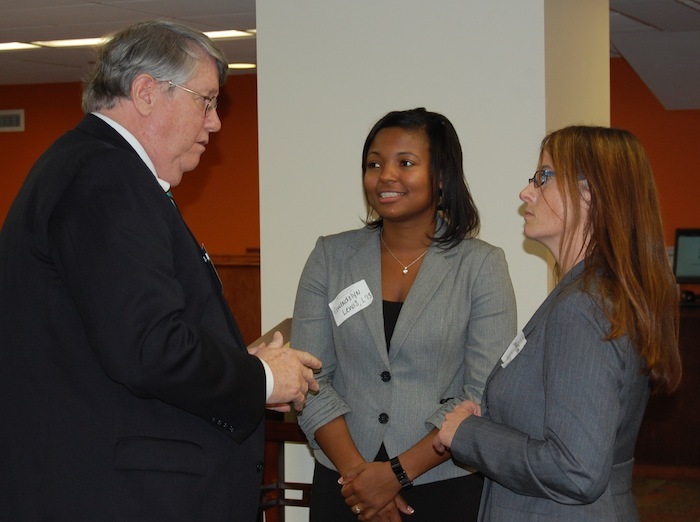 Opportunities to counsel businesses through the law schools Small Business & Entrepreneurship Clinic.